This image shows 2, AAA LR03 alkaline batteries with different-shaped negative terminals. It's OK if the wrapper is flush with the negative terminal, the problem is if the terminal is recessed BELOW the wrapper. First, Duracell has since discontinued the Ultra, so many people contact us wondering what to use as a replacement; and second, the Pulse Barryvox, after one of the more recent firmware upgrades, is now capable of taking either Alkaline or Lithium batteries; and finally, there have been changes to the standards batteries are built to which have necessitated some adjustment. First, a note on why we recommended specific batteries. In addition to simply recommending what we felt was a higher-quality battery, Mammut uses a special battery contact in order so that under an impact the beacon never loses power—because batteries have mass, in an impact the momentum of the battery against a normal spring-type contact can cause it to momentarily lose the electrical circuit and therefore to lose power, and this has an effect on the search. For the Pulse Barryvox we now recommend any high-quality LR03 Alkaline or LR91 Lithium AAA batteries AS LONG AS THE NEGATIVE TERMINAL OF THE BATTERY IS NOT RECESSED INTO THE WRAPPER OF THE BATTERY. 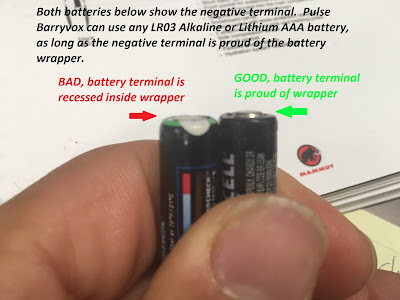 Some batteries have a pretty flat negative terminal which is flush with the wrapper--this is generally OK, but it should not be recessed so it's BELOW the surface of the wrapper or the circumference of the battery as shown in the diagram above. Lithium batteries have a much longer longer life (310 hours versus about 250) and eliminate the possibility of acid corrosion which can render a beacon unsafe to use. Lithium batteries have some quirks that are critical to be aware of, so read up on that AT THIS LINK before you use them. The Element Barryvox cannot use Lithium batteries, so only high-quality LR03 Alkaline AAA batteries are recommended. We define "high quality" as being a premium-level battery from one of the well known companies such as Duracell or Energizer, as their consistency and quality is usually better than non-branded or house-branded batteries. We have not made specific model recommendations since these models change frequently. The lower the remaining battery capacity, the higher the chance of a battery failure such as a sudden drop of voltage or reverse loading. When using alkaline batteries, the likelihood of acid leaking increases with decreasing battery life. When replacing batteries, always check that the contacts on the battery and on the device are not corroded and do not show signs of acid residue or battery leakage. If there is any sign of acid on the new battery, DO NOT use this cell and immediately check all batteries from the same purchase. ALWAYS remove alkaline batteries before longer-term storage, especially in humid environments or before shipping. It is better to leave Lithium cells in the beacon until they require replacement. After installing new batteries, always turn the device on and calibrate it [PULSE Barryvox] before you store it. In order to detect battery changes, the Pulse Barryvox applies a permanent battery monitoring function. Once the device is calibrated, the power consumption during storage is negligible, however, prior to device calibration the drain is sufficient to have an influence on battery life. when they are first inserted should be immediately replaced. However, a major drop of remaining battery capacity may take place when the device is used for a prolonged duration in SEARCH mode, in particular in cold temperatures. If you are still reading, then you're a good candidate for reading through the Application Safety Guide--there are more battery recommendations there as well as other useful information. Check it out today and let us know if you have any questions.